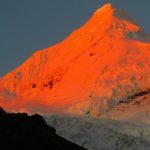 Come with me on a 2-week journey to three of the most impressive peaks in the Cordillera Blanca mountain range, Urus (5,420m), Ishinca (5,530m) and Tocllaraju (6,000m). Each one of these mountains is unique. With each one offering it’s own challenges, gifts, views and personalities. Urus will be the first mountain we will scale. The easiest of the three, there will be no rush during the ascent to the east ridge summit. Instead it will be a moderate climb that will be comfortable and fun. Ishinca offers a higher summit and steeper climb. 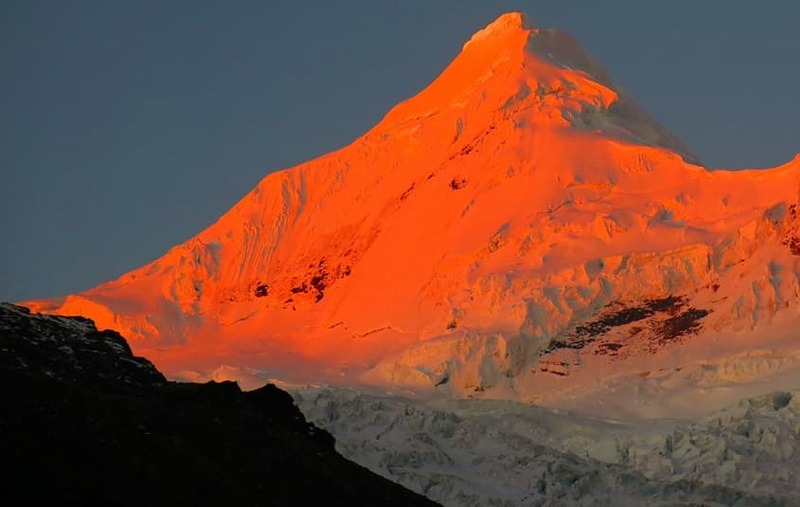 However, this more challenging climb will properly prepare you for the final mountain, Tocllaraju. While a gradual build-up to the grand finale, the summit of Tocallaraju, this 2-week trek will allow you to develop your skills and get better acquainted with your equipment during rest days. Filled with variety, this expedition will see you spending 7 nights in a hotel and 7 nights camping in the Peruvian Andes. There will be rock climbing. There will possibly be ice climbing. 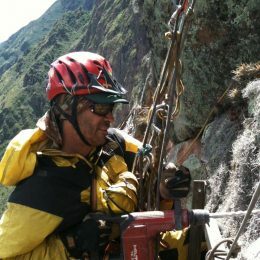 You will use crampons, harnesses and rope, and plenty of other equipment. you will traverse ice, rock and Andean tundra. Besides the three peaks, you will also get to see a great deal of amazing things. Most people dream of scaling one mountain, but I’m offering you the chance to scale three in one trip. So come with me and see the dramatic, spectacular peaks of Urus, Ishinca and Tocllaraju. And if you are interested in a ski tour on the mighty mountain, Qupa, within the Cordillera Blanca, you can also join me on this trip. Private pick-up at Lima International Airport. Transfer to hotel in Lima for meal and rest. Private transfer in the morning to bus station. Comfortable, first class bus ride to Huaraz (approximately 8 hour ride). Settle into hotel for the night. Orientation meeting in hotel. 4 hour acclimatization hike to the puka ventana (red window). Spend the night in Huaraz hotel. Approximately 5 hour hike to the Laguna Churup. Return to Huaraz hotel for the night. Acclimatization hike to glacier on Vallunaraju mountain. Possible ice climbing (depending on weather conditions) or skills review. Return to Huaraz hotel for the night. Drive up to small mountain village of Pashpa. Load up donkeys before taking 8 mile hike to the Ishinca Valley. Establish base camp at 4,100m. Leave camp at 4 am. Work up to summit of Urus. Approximately reaching it by 11 am. Return to base camp for dinner and rest. Leave camp at 4 am. Work way up to summit of Ishinca. Approximately reaching it at 1 pm. Descent back to base camp at approximately 6 pm for dinner and rest. Approximate 6 hour trek to high camp. Dinner and early bed time. Wake up at midnight. After light breakfast, 2 am departure to summit of Tocllaraju’s north ridge. Return to high camp at approximately 2 pm. After rest and food, make way down to base camp for dinner and sleep. Sleep in and awaken to delicious breakfast. Pack up and load donkeys for hike back to Pashpa and return to Huaraz. Check into hotel. Last minute shopping for family and friends before leaving for Lima at 11am. Arriving at the airport or hotel by 7:30pm.